Bonita Bolero is made up of 25 square motifs which are crocheted and then joined together with a zig zag pattern. Bolero is crocheted in dk cotton using a 3.00mm (D) hook. 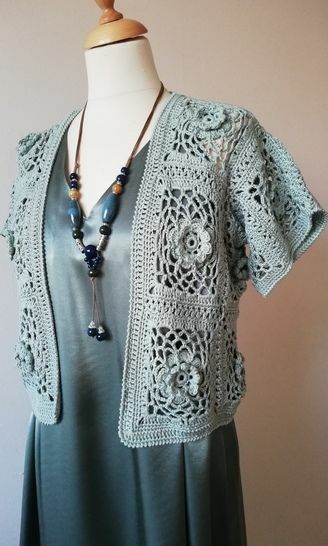 The pattern can be adjusted to create a cardigan by adding squares to lengthen bolero. Sizes To fit chest measurement 32/34, 26/38”, 40/42, 42/44. Gauge There are instructions for four different size motifs in pattern to achieve correct gauge for size required.